Forum Pumps and Valves is one of the leading providers of production and drilling products. 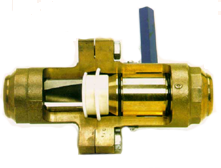 From valves and seats to pistons and pumps, Forum Pumps and Valves products are known for world-class quality. The Baker SPD In-Line Choke is designed specifically for controlling gas and liquid flowline rates. Water and CO2 systems are designed to control the rate of fluid injections. The satellite sleeve absorbs the cavitation and pitting action of the fluid as it takes the pressure drop. © 2019 Torrent Engineering & Equipment. All Rights Reserved.